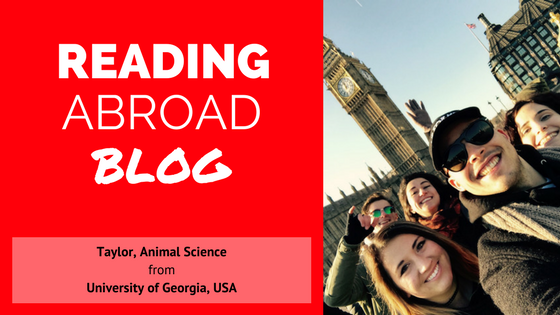 When you take part in a study abroad program, you sign up for more than what’s proposed in the name “Study Abroad’. Not only do you leave an academic system that you’ve already adjusted to, but you leave your old university home and respective social groups. Coming from the University of Rhode Island, where the campus acts as a student city filled with familiar faces, I knew no one here. However, I soon realized that didn’t mean I was alone. Since the first day of orientation, I’ve met countless other international students which turned into a close group of friends. I’ve also become friends with my English flat mates, as well as the English flat mates of my international friends. With their help, I have created lifetime friends and experienced the social life they have to offer. 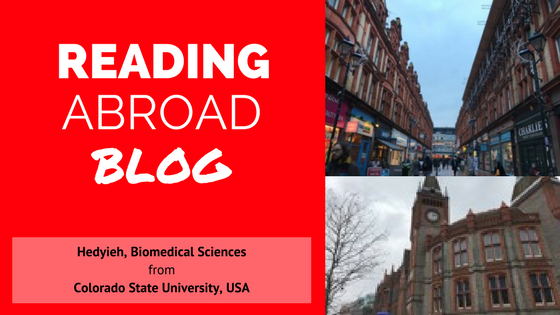 The Erasmus and study abroad team has helped expose me to new places around the UK and test the waters of exploration through the comfort of the University. The picturesque Whiteknights campus continuously gives me a friendly and safe atmosphere while its location gives easy access to England’s capital and a subsequent gateway to all over Europe. 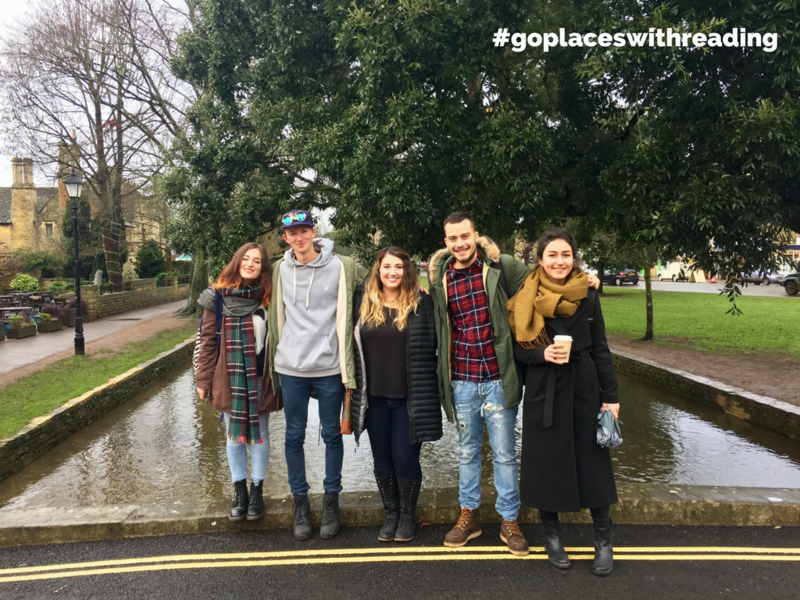 In a time where everything is new and you’re forced to immerse yourself into a culture that is unique to your own, the University of Reading and its community has managed to make it a home away from home. I took a chance with Reading and chose this school out on a whim. I knew it was super close to London and that the academic program at the university was very good for many courses but little did I know how thankful I would be for Reading. With the 5 months I have had here, Reading has grown on me each day and I am so glad that this was the place I decided to make my home. Lets start with academics. So many programs here in Reading are flourishing. I have been challenged studying for exams and essays due to the rigor my professors provided for me. I loved the practicals offered as well. I am a biomedical science major and neurobiology had a really cool practical. I have never dissected a brain and having that opportunity was incredible. Professors here are really passionate about their work and give as much information as they can throughout their lectures. Location, location, location. Reading is the perfect place to be honest. It is a thirty minute train ride to London and nearly an hour or two to other cities and places like Oxford, Dover, Cambridge, Stonehenge, Bath, etc. It’s amazing! Besides London Stansted Airport the other three airports are super close and choosing any of them for a cheaper flight was perfect. While traveling Europe I never had a plane ride longer than two and a half hours which was so nice, England is so central. With so many friends who were also studying abroad I was able to go to London and back as often as I would like for a very reasonable price. Living in Reading was perfect because it was not as expensive as living in London. What is there to do around here? Everything. Town center is awesome and its where my flatmates and I found ourselves with any downtime in Reading. You could walk or catch the 21 bus and get to town in fifteen minutes. Any home goods and groceries needed throughout the term were easily accessible and there was a variety of stores to choose from. Popular shopping stores and restaurants are everywhere. Bars, pubs, and clubs are open every night and provide an evening filled with dancing or cheering on a football team. Reading has a small town vibe, it is not very big and most of it can be visited within a few hours but that is the best part of it. There is not a certain type of people living here, it is a big melting pot of diversity so every person you will see has a different style in clothing and you will run into people of all ages. Everyone here is so friendly and it is so nice having that kind of environment when going out or just spending a day in town with friends. I could not be more comfortable in this awesome town. 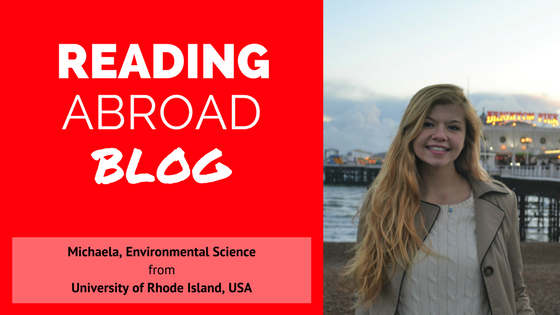 As my time studying abroad at the University of Reading draws to a close, when I look back and reflect on my experiences, one of my favorite aspects of studying abroad at the University of Reading was the guided trips put on by the study abroad office. The study abroad trips were wonderful because the study abroad office provides transportation and an itinerary of ideas of what to do. 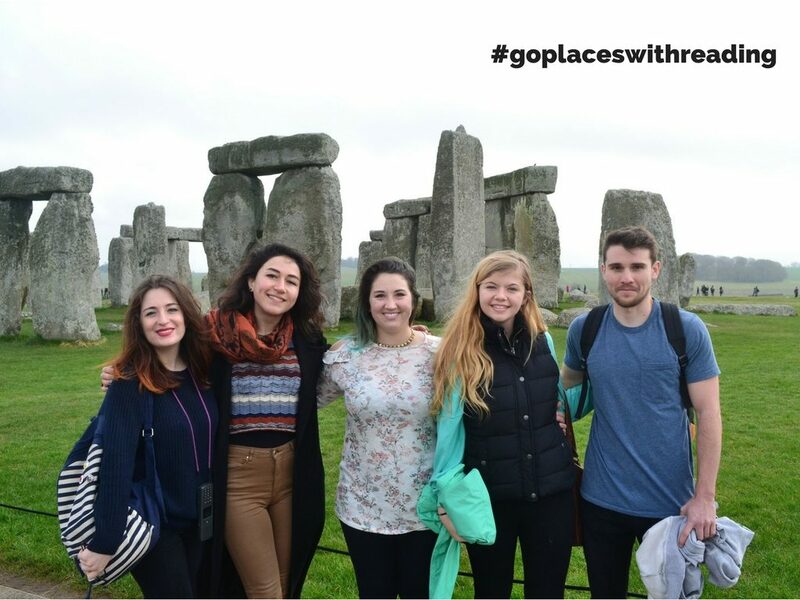 The study abroad trips consisted of many members of the study abroad program visiting some place in the United Kingdom all together. All of the trips were amazing because on my own I may not have ever found out about the places we visited and got to hang out with the rest of the study abroad group. 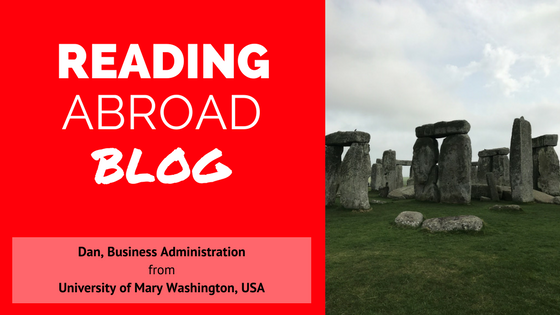 My favorite trip put on by the study abroad office was the trip to Stonehenge. Stonehenge to me is one of the must see places when visiting the United Kingdom. Coming from the United States, it blows my mind just how old the site is and how people from thousands of years about managed to move such large rocks. The Stonehenge trip started out on a cloudy day with around forty members of the study abroad group waiting for the bus to arrive. The first thing I always enjoy about the trips is that you get to hang out with and talk to members of the study abroad group that you would not normally do so. Talking with other members of study abroad is honestly one of the best things about the whole experience because typically in my everyday life I interact with the same people. It is a fascinating experience to branch out and talk to people from other countries and cultures. After getting on the bus it was around an hour journey to Stonehenge. I always enjoy the bus rides because I like to just look out the window and see the country side of a country I am not from. When we arrived at Stonehenge the bus dropped our group off at the visitor center and we all had the option of take shuttle or walk a little over ¾ of a mile to get to the rocks. I decided to walk. I think it is always important when visiting to see as much as possible because that is of course what I am study abroad to do. To see new places and have new experience that I typically wouldn’t have in my everyday life. The walking path took me through beautiful landscape of green open fields filled with sheep with little patches of forest scattered here and there. The fields were also dotted with large mounds, which after reading several signs I found out were burial mounds from around the time after the completion of Stonehenge. After walking a bit further I got my first sight of the famous monument that is Stonehenge. The first thing I noticed is how big the rocks actually were. All pictures I had seen don’t give credit to the scale of the actual thing. That is something else that I learned while on my study abroad. You can watch videos of a place and see tons of pictures but you don’t ever fully experience a place until you are up close to it and get the feeling of the area around it. Stonehenge was an amazing place to visit. It is a great experience to see a place that I have heard people talk about all my life. Study abroad is a great idea because you have experiences and create memories that you will have for the rest of your life. The greatest part of studying abroad is making your own adventure. Here is the story of how mine began. When I left home at the end of December, I first went to Germany to visit my best friend. I met her when she studied abroad in my American high school 7 years ago! Yes, we kept in touch. I spent an amazing week with her in Dortmund. Eventually it was time for me to check into the University of Reading; I flew from Düsseldorf and landed in the London Stansted Airport. Little did I know just how difficult it would be to get from Stansted to the city of Reading. A bus, an Uber, a lot of recently converted pounds, and three hours later I arrived at Northcourt outside Benyon Hall. To my dismay it was 10:00pm at night. It appeared to be empty, but a nice security guard who shared my name, Mr. Taylor, kindly helped me check in and walked me to my building. I was exhausted, lonely, and completely bored unable to connect to wifi. I remember laying in bed that night thinking “what have I done”. Despite realizing I left my boyfriend and dog (you can see where my priorities are) for six months, I didn’t cry. I was hoping things would turn up and this would become one of the best decisions of my life. I was right, within that first week I met several friends who would quickly become my “family” here. They were also study abroad students from all over: America, Italy, Ukraine, Australia, and Turkey. These people have become my lifelines here. We travel together, party together, even have chill nights just watching movies in the common room. My first week at the University of Reading I learned two important things. One, plan ahead especially when traveling, but don’t get discouraged when it takes longer than expected. Two, be outgoing, talk to everyone you meet and really get to know them. That is how you make friends that will last a lifetime.